IPCI's program. A fourth IPCI organization, IPCI-Canada, is helping to build awareness and raise funds for IPCI's activities. IPCI was formed in May 2000, after an international group of bow makers came together out of concern for the widespread destruction of the Atlantic Rainforest of Brazil, the world's only habitat for pernambuco. From the beginning, IPCI's goal was to work in partnership with like-minded Brazilian counterparts to increase scientific knowledge about pernambuco and to promote its replanting and conservation. 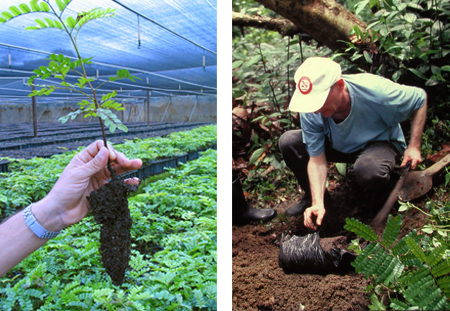 In 2001, IPCI contacted the Comissao Executiva do Plano da Lavoura Cacaueira (CEPLAC), a Brazilian government agro-forestry agency focused on cacao. Following extensive discussions IPCI formed a partnership with CEPLAC to create the Programa Pau-Brasil, a science-based project to work with local cacao farmers and landless community members to replant pernambuco in Bahia, Brazil. For more details about IPCI's program click here. IPCI and its members pledge to a self-imposed moratorium on any new wood purchases until inventories of pernambuco forests have been completed and conservation plans that will enable the sustainable use of pernambuco by future generations have been implemented.